To give to novices an idea of the high rate of new entities you can discover, I remember that as SWL I captured over 87 countries in most CQ zones in 43 hours distributed on 5 consecutive days, only equipped with a long wire of 40 m tight 3 meters high, and many times spent behind the radio, HI ! You can imagine how excited I was ! But still better, as licensed amateur radio and using a small antenna (vertical or dipole) I could easily reach 100 DX entities during a CQ WW contest and of course calling CQ DX if I wanted to reach far entities. So if you don't have your full privilege license yet, do no more wait for it and become an amateur radio ! During my ham activities, I have confirmed thousands QSOs from which I extracted the following series. Of course gathering so many QSLs I have also won tens of awards that I listed on this page, some won when I was SWL and not replaced yet by worked versions. But I am not an award chaser. I simply present you them to show you what they look like to. Some hundred QSLs are still somewhere in a distant post office waiting their recipient. So I warmly thanks QSL buros and their managers all over the world for the huge work they perform in transiting these QSLs, one of the most important object owned by amateurs and listeners, pride of our shack, maybe prior to our rig or antenna, HI ! Most of these QSOs were worked (or heard) using a Kenwood TS-570D transceiver used barefoot (100 W), connected to a short vertical, a G5RV or a Windom, sometimes to a 3-element beam. 90% of QSLs displayed in next pages, about 1% of my collection, were often the first QSO worked or heard for that DX so I asked them QSLing direct to be sure they arrive at home, but not necessary quickly, even if the QSL manager leaves in a near country. In QSLing direct, the usual delay fluctuates between 1 month and... more than 2 years ! The remaining QSLs were received via buro, at a much slower speed that fluctuates between three months for the fastest (bordering countries) and... several years. As many hams, a few years after have won my licence I continued to receive QSLs from the time I was SWL ! eHam.net reported a case were a QSL was received by an association 77 years later. Unfortunately the sender was passed away... When we say that patience is a virtue ! 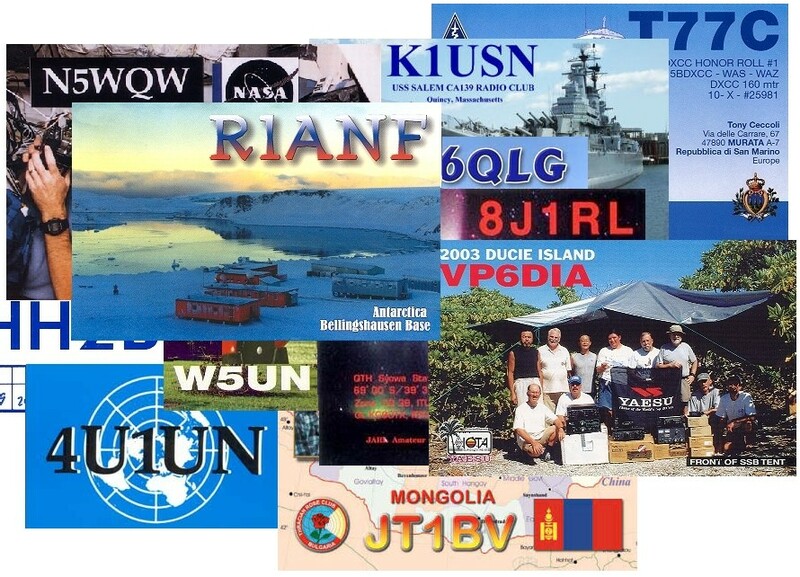 For this gallery I selected many QSLs that do not display the ordinary layout showing the call sign above a text box with the QSO information printed on vellum bristol. These ones are true postcards ! They are printed on a 200-250 gr/m2 paper, the recto is most of time lustre or plastified, sometimes with a flap (mainly DX-peditions, like XY5T, VP6DIA), the call sign or the background can be in relief (e.g. YB0IR) or golden written (e.g. YB0AI), and the picture offers a great aesthetic value. QSLing becomes an Art and has requested a dedicated binder ! However such colorful QSLs represent less than 10% of the ones I have exchanged. This printing quality is of course not mandatory to get confirmation of a QSO, HI ! If you like QSLs, see Friedbert Bruender's website, alias DE0BRF where you will find one of the most complete collection of QSL galleries shared by amateurs and SWLs.